I wonder how many of you know the difference between the Immigration Solicitor, lawyer and advisor? And is it important? The reason I am writing this post is that I don’t think solicitors been tarred with the same brush with so-called advisors. I have had several clients who have come to me gun blazing with complain of legal representation and advice previously given by legal reps. Most have alleged to have been ripped off by a solicitor, but upon close examination, it transpires there legal rep were neither a lawyer nor a solicitor. Just last week I was told of an appalling case of someone been really taken in by some so call immigration lawyers/advisor. This guy had paid to whom he thought were solicitors, about £10,000 in fees for an application for him and his family (wife and a newborn) to extend there leave in UK- application never even reach to the UKBA and he is still trying to trace his passport as the guys packed up and vanished. Sad thing it turned out the so call advisor were not solicitors, had misadvised him on what application he could make and had closed down the office after taking a lot of clients money (mostly cash with no receipt) and legged it – leaving him at the mercy of UKBA who now want to deport him. Any person who is learned in the law is a lawyer. So, if you have gone to university and studied law then you’re a lawyer. In other words, this is the starting point for an attorney, counsel, barrister or solicitor. For a Lawyer to qualify as a Solicitor or a Barrister one must undergo additional training programme, on top of his law degree. This would normally include undertaking a one year postgraduate course know as the Legal Practice Course (LPC). During this training in Law School one learn how to practice law. i.e. how to use the substance of the law in practice , finding solutions through legal research, advocacy skills, client care and relevant court procedures. A Trainee Solicitor (or Pupil if they want to be Barrister) is thus a lawyer who after the LPC is undertaking a two-year Training Contract working in a Solicitors firm under close supervision (Or Barrister Chambers) before they would qualify as a Solicitor (or Barrister). Also note that since Immigration is a very specialized area it is also common that an Immigration Solicitor has undertaken several Training Seminars, Masters Degree or further training such as under Immigration and Asylum Accreditation Scheme (regulated by Law Society). All solicitors are closely monitored and regulated, they must attend Continues Professional Development training in order to renew their license yearly. Solicitors must work under a firm, which is regulated by the Solicitors Regulations Authority (SRA), such firm must have indemnity insurance cover (e.g. the firm I work within covered up to 2 Million) and a clear procedure for rising complains. Which means if anything goes wrong there is a clear way of getting it sorted. You can also complain to the regulating body and solicitor risks losing it all by been struck-off the Roll of Solicitors if they, for example, disappear with your money. It is easy to check if your advisor is a solicitor or not from the law society website – Click here ! Anyone, including you, regardless of your education background could be an immigration advisor in a few weeks. So NO law degree, no law school, No training contract – required! In short, while it takes a minimum of about six years of hard training to become a solicitor, while you can be an immigration advisor within a month (would be within 3 days save for the delay caused by the CRB Check). All you would need is to read up the basics about immigration, the knowledge that most of you in this forum already have, and you’re good to go! Set up shop and put a big billboard saying Immigration Advisor, and if you also happen to have a law degree, then Immigration Lawyers. Well, don’t get me wrong – Not all Immigration Advisors are rubbish at there job. Know there several Immigration Advisor that are very good and competent – some have a law degree or even LPC. In fact, some are non-practising solicitors who have to choose to work in immigration issues only under the OISC, as insurance is cheaper and regulations are more relaxed than under The Law Society. There also the various level of accreditation with Level 1 been then one described above. However, the highest level of accreditation Level 3 equates to Level 2 under the Law Society accreditation. But my point is before you make payment, shouldn’t you know who is dealing with your case? I would recommend that at the very least you have a solicitor having the overall responsibility of your file. Second best thing is to have an experienced Level 3 OISC Adviser. Why? Well… it’s common sense if some were to take a risk with clients money, who do you think will take more risk, one who stands to lose his hard earn license that took six years or one who got his right to practice immigration within a month? Of course, their cowboy lawyers just like in any other profession but if anything goes wrong at-least there is easy of remedy. The Solicitor Regulations Authority has in the past not hesitated to order solicitors to pay compensation or refund fees for misconduct or negligence. Professional Conduct and Ethics of a solicitor, for example, dictates that: I am clear from the word go about my fees; confirm my advise in writing and keep you informed of any progress on your case – you should not be chasing me for months on end to find out what happened to your application. Also, an important point it that solicitors due to their extensive training, which includes Legal Research at Law School, they’re able to handle complex cases. Thus where it’s not a straightforward case, say e.g. you don’t meet finical income, a solicitor can use his research skills be able to make strong representations to support your application under Human Rights or Outside the Rules. They can use recent case law to support your case ( a skill learnt in law school and Training Contract). So a good analogy of Advisors and Solicitors would be in the Constructions where you have the Civil Engineer who draws up the plan and supervise the sub-contractor and handymen such as the Bricklayers. A seasoned Handyman my be able to fix many things in the house but if you want to build the whole house from scratch or major works – you call the expert, right? While I would be happy for the Handyman to do everything in the house under the direction of the trained Engineer, I would not ask him to build me a whole house unsupervised. Or, If your going for a tooth canal wouldn’t feel more comfortable if the person working on you was a trained Dentist other than Dental Nurse who has just “picked it up along the way” but never attended dental school? So the next time you are seeking legal assistance on your Immigration matter, Know whom your paying for? And as the saying goes – you get what you paid for! If anyone has an immigration inquiry, please contact for a free initial consultation on my Mobile (07544669131) or Skype: tito.mbariti, I am an Immigration Solicitor Specialized in Immigration and Human Rights. After speaking to a few Solicitors, I spoke to Tito during my free consultation, I knew straight away he was the man I would trust with much a delicate matter. Tito's knowledge with regard to immigration is brilliant. "Thank you for all your efforts Tito, you are amazing. You have always acted professionally, with diligence, speed and accuracy, and always friendly." 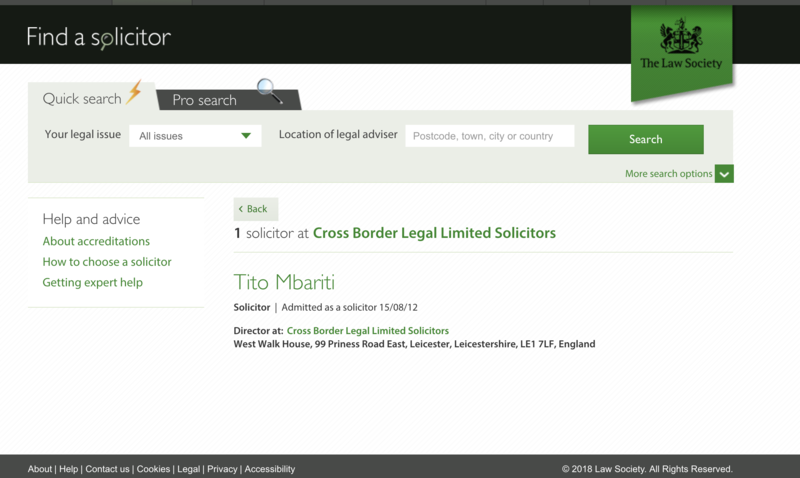 After receiving conflicting information from UKBA, I contacted Tito Mbariti at Cross Border Legal blog. This was the best decision I had made. Tito advised me on the best course of action and briefed me fully on the documents I needed to submit, he made a case letter on our behalf and we applied for our visa for our son. This process sailed through the immigration minefield thanks to Tito and his team. Highly recommend his services and Cross Border Legal to anyone who has a complicated or even simple immigration matter. Came across Tito's info accidentally after getting frustrated with all the UK immigration run around, nothing was us straight forward. Tito was very professional and helpful and went beyond the call of duty and it a personal, advising us on what to do at every step. His fee was also reasonable and there was no hidden fee and today my spouse and I are breathing the same UK air. I'll recommend Tito at the drop of a hat any day.